Ever buy coffee from your local donut shop in the morning? The shelves are usually filled with different flavors and styles of donuts. The ones that seem to catch my attention are eclairs. 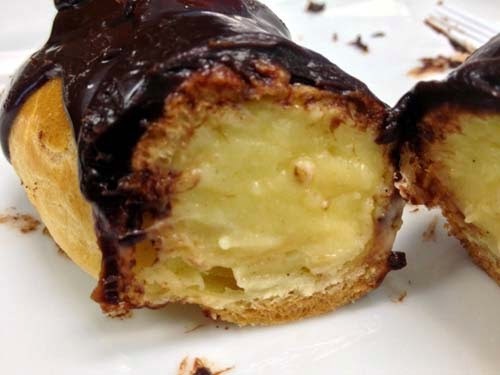 You've seen them, chocolate glazed treats with creamy custard fillings. You can make them at home, too. With a little help from YouTube, learning how to cook and bake hasn't been a problem. 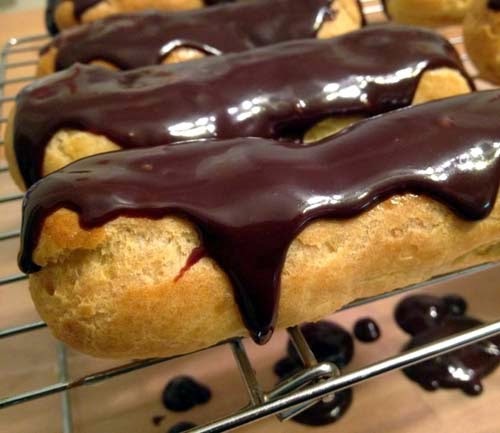 Here's a recipe from Laura Vitale that's used to make these chocolate glazed eclairs. Make the filling by mixing milk, corn starch, sugar, egg yolks, vanilla paste and salt in a sauce pan. Whisk before heating over stove in medium heat until it thickens. Pour thickened filling in a bowl, cover with plastic wrap and refrigerate. Make the pastry dough by mixing water and butter in a sauce pan. Heat until butter is melted. Mix and remove from heat. Add flour and mix until the mixture is doughy. Then heat up again while continuing to mix. Allow dough to cool for a few minutes. If you have a stand mixer, place dough in the bowl and run the paddle for 1 minute to cool off the dough. Add eggs one at a time while paddling in medium setting. Scrape the sides of the bowl as necessary while mixing. Spoon dough in a piping bag using the largest tip. Layout the dough on a baking tray lined with parchment paper. Each one should be the size of a hotdog bun. Brush the top of each one with water. Bake in oven at 425 deg F for 10 minutes. Then turn the oven down to 350 deg F and bake for another 20 minutes. Then remove from oven. Pastry should be golden brown and piping hot. Using a knife, poke a hole on both ends of each pastry. Make the glaze by heating heavy cream in a small sauce pan. Bring to a simmer. Once hot, pour in a bowl with semisweet chocolate chips. Set aside to allow hot heavy cream to melt chocolate chips. In the meantime, begin stuffing the pastry with filling by spooning the filling into a piping bag with small-to-medium tip. Inject the filling into each side of the dough through the hole you made with a knife. Mix up the glaze to make sure that it is completely blended. Apply the glaze on top of each dough. 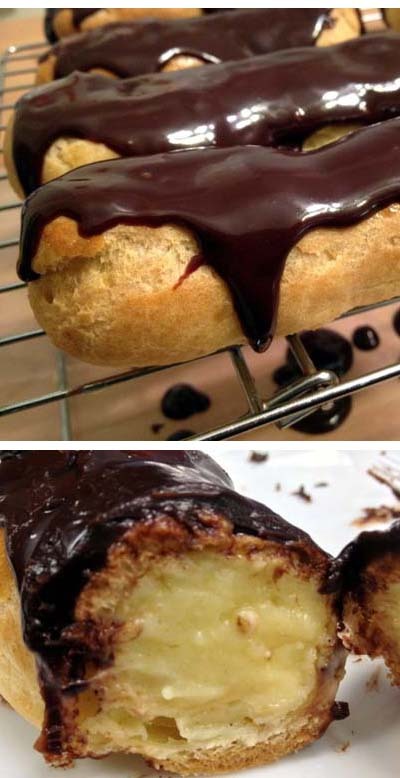 If you use a big enough bowl, you can just dip the pastry into them instead of spooning the glaze on top. Allow the glaze to cool and set before serving. See the video for direction.